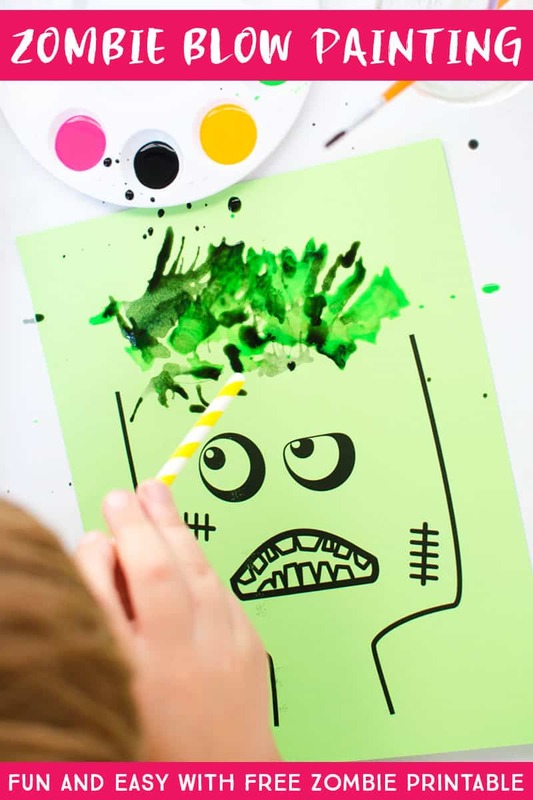 Grab a straw and our zombie printable for a super-fun blow painting activity for kids. 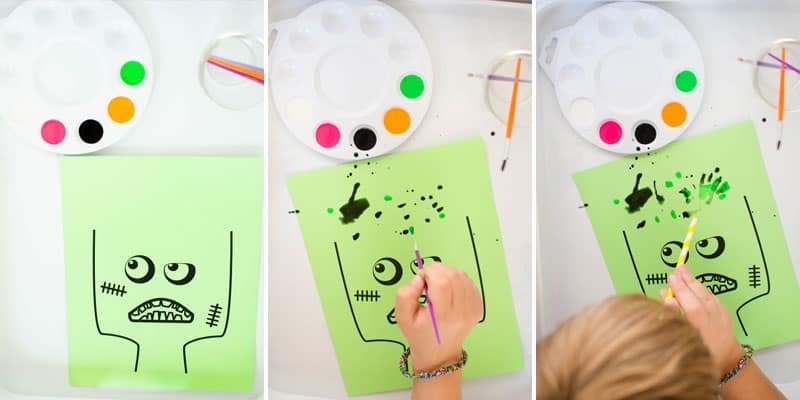 This is a fun and simple Halloween activity for any kid. We had a big storm (Hurricane Florence) come through last weekend that had us all stuck inside for days. Thankfully, we were only on the edge of the storm, but we still had plenty of rain, wind, and even some nearby flooding. We aren’t near the coast, so we felt relatively safe staying put. And, we were fully prepared with water, and food, and all the things one reads that one should have for a hurricane! I did not, however, have this little painting activity worked out yet, though, which would have been a fun way to pass a little bit of time as we all hunkered down inside for the weekend. It happens to be the time of year when my mind is laser-focused on Halloween everything. But, this is definitely not just a Halloween activity. Zombies are fun any time of the year. Nuff said. You can not mess this activity up, it’s that simple. Grab your paper with the zombie head using our free zombie PDF. 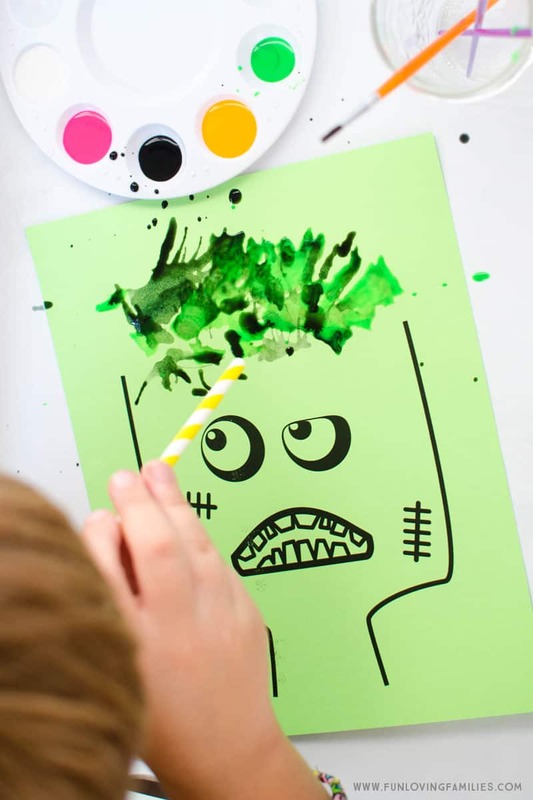 You can use plain white paper, or go for zombie green like the ones in the photos! Add enough water to your paint so that it’s runny. This will make it easier to blow around. 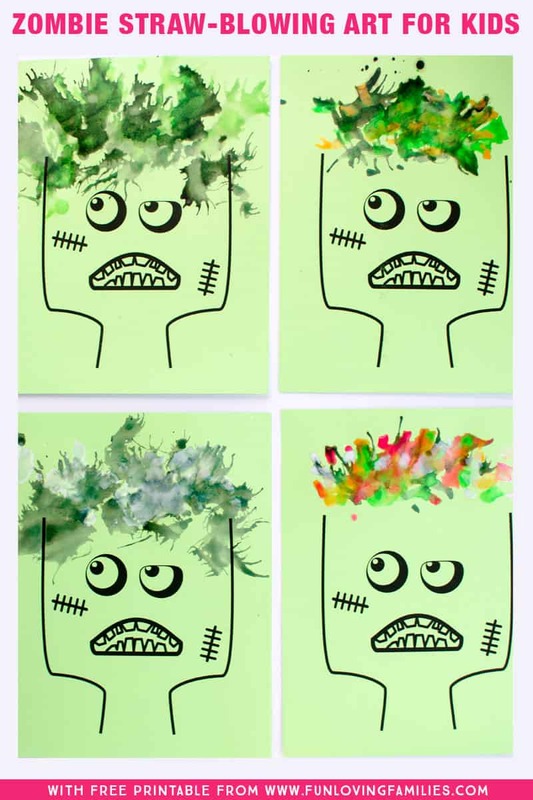 Once you have your paint, use a paintbrush to dab dots over the zombie’s head. Or, splatter the paint off of the brush and onto the paper, Jackson Pollock-style. In the photo below you can see how the different styles look. Mine are on the left, and I did the splatter paint method. My daughter (who’s work is on the right) was more selective in where she put her paint and used the dabbing method. Make sure you print off plenty, because I guarantee nobody will stop at just one painting. It’s so much fun to experiment with different how and where to put the paint. Which colors to use together. And even how to blow the paint around. This is very much a process-driven art activity. Although, we loved seeing the different outcomes. It’s also a fun activity to do with a group. Join the kids! You’ll have fun creating and spending time together. See all of our fun Halloween Ideas here.